FRANKFORT, Ky. (February 25, 2019) – Deep roots grow leaders. That’s how Kentucky’s agricultural community develops leaders for our future. “Deep roots grow leaders” is also the theme of this year’s Ag Tag campaign to raise funds to invest in organizations building the leaders of tomorrow. Kentucky farmers recently may have received a note from their county clerk with a reminder to renew their farm vehicle license plates. At the clerk’s office, they may see a poster featuring our state 4-H and FFA officers [r20.rs6.net] asking to make a voluntary donation of up to $10 to the Ag Tag Fund. Donations are divided equally among Kentucky 4-H, Kentucky FFA, and the Kentucky Department of Agriculture (KDA). Half of the 4-H and FFA funds go back to the county where the tag is purchased. At the KDA, we use our share of the fund for initiatives that promote agriculture in Kentucky, such as the Kentucky Leopold Conservation Award and the Kentucky Ag Athletes of the Year scholarship program that we conduct annually with the Kentucky High School Athletic Association. 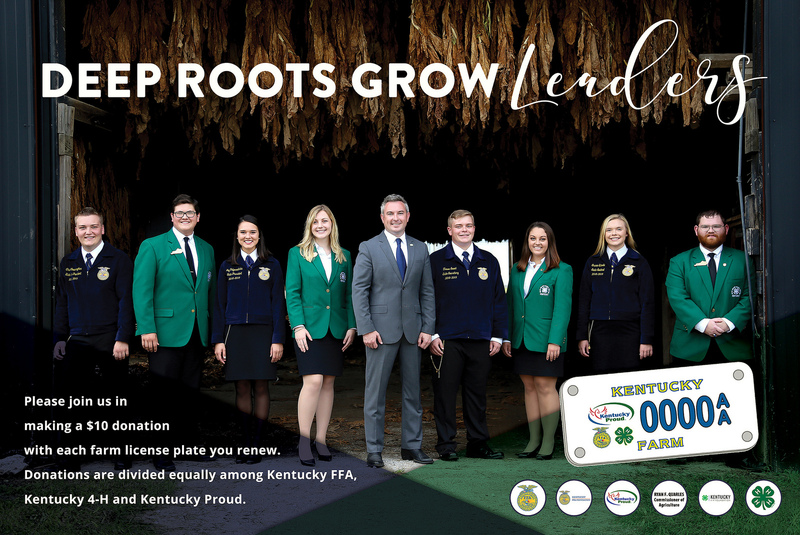 The fund supports many commodity organizations and events, from the Kentucky Agricultural Leadership Program (KALP) to AgLand at the Kentucky State Fair. Kentucky FFA provides over $20,000 in grants to agriculture programs to make a capital investment in their curriculum or facilities. It provides $1,000 to each of the 12 FFA regions to recognize students at regional FFA banquets and more than $13,000 of travel scholarships for Kentucky FFA members who compete at the National FFA Convention. It also supports statewide initiatives such as the Kentucky FFA website, state officer leadership development, and support for teacher educators at the university level. The Kentucky 4-H Foundation uses its portion of its Ag Tag funds to support statewide programs such as STEM events, Issues Conference, the Performing Arts Troupe, 4-H Summit, and state officer scholarships. County 4-H councils use Ag Tag dollars to provide opportunities, such as 4-H camp scholarships and travel for life-changing, educational experiences, to enable local 4-H youth to grow as leaders and engaged citizens. FFA chapters are free to use the money to meet the greatest need in their community, such as FFA jackets for students in need or helping cover travel costs to leadership events. As an FFA kid, a 4-H Cloverbud, and now your ag commissioner, I can tell you first-hand how hard Kentucky FFA, Kentucky 4-H, and the KDA strive to cultivate the next generation of leaders, citizens, farmers, and agribusiness operators. Your support of the Ag Tag Fund will help us achieve that goal. Kentucky farmers donated more than $612,000 to the Ag Tag Fund last year, but we believe there is plenty of room to grow. Please consider making a voluntary donation to the Ag Tag Fund so that our roots can continue growing strong leaders for the Commonwealth.